Thanksgiving is right around the corner, guys. I’ll be the first to admit that I’m not to crazy about turkey. As a result, I tend to channel all my Martha Stewart brain cells toward unconventional appetizers and sides. A few weeks ago, I was researching stuffing recipes to write a holiday article for one of my freelance positions. Aside from realizing that I’ve (somehow) never made stuffing from scratch, I noticed most recipes used broth or eggs to hold everything together. And as someone who loves to use pumpkin puree as an egg replacer in baked goods (not because I don’t like eggs… I just love the concept! ), I couldn’t help but experiment by using pumpkin as a binder. Cue this pumpkin-infused Thanksgiving stuffing recipe, baked in a butternut squash. The final verdict? I. Am. In. Love. 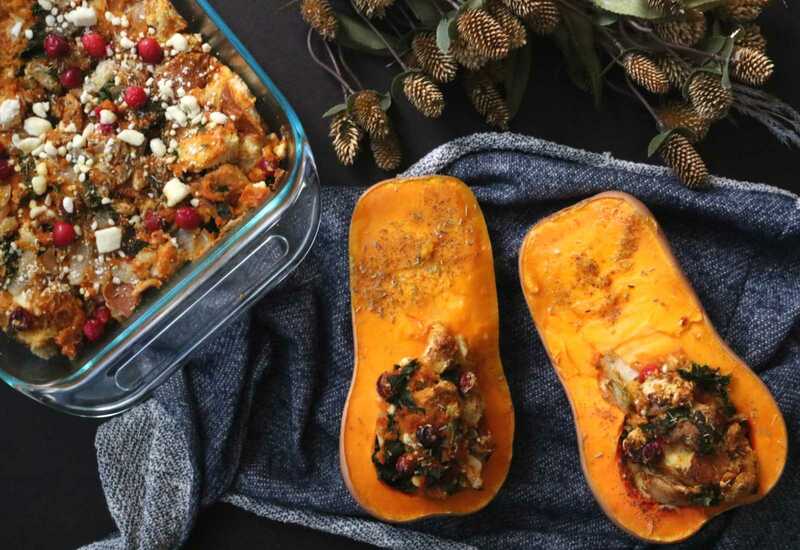 While half the fun is baking the stuffing in a squash, you will need an 8×8″ baking dish to cook the rest of the stuffing. Alternatively, you can totally ditch the squash and just bake everything in the dish. 1. Pre-heat the oven to 400 degrees F.
2. Slice the bread into bite-sized cubes. Set aside. 3. Over medium heat, sauté the kale and onion in coconut oil or butter. Add spices as desired. Cook until the onion is translucent and the kale has wilted. 4. In a large bowl, combine with the bread cubes, pumpkin puree, feta cheese, and cranberries. Add a sprinkling of brown sugar and more spices. Mix until the bread is thoroughly covered with pumpkin. 5. With Butternut Squash: Slice the squash in half and remove the seeds. Fill the squash with generous scoops of stuffing. Drizzle melted coconut oil or butter to the each half, covering both the squash and stuffing. Sprinkle brown sugar. Place the two halves on a baking sheet; add the rest of the stuffing in a greased baking dish. Bake both for 1 hour and 15 minutes. 6. Without Butternut Squash: Place the mixture into a greased baking dish. Drizzle coconut oil or butter to promote browning and crispiness. Bake for 1 hour and 15 minutes; the bread should turn light brown and crispy. BRB, eating this all year round.